Update Oct. 1, 2018: New York City’s Business Integrity Commission lifted its suspension of Sanitation Salvage after the private trash hauler agreed to oversight by an independent monitor. The commission had declared the company a threat to public safety when it halted the company’s operations after two pedestrian deaths, including a fatal accident involving an off-the-books Sanitation Salvage worker. Given the exhausting nature of commercial driving, federal authorities have basic safety protocols to protect workers and the public. The law limits drivers’ hours and requires adequate time off between grueling shifts behind the wheel. 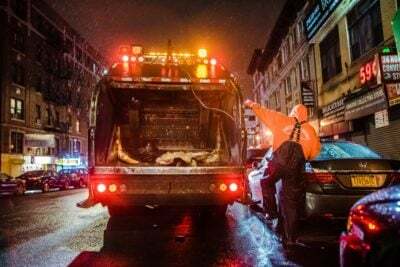 Sanitation Salvage, a troubled Bronx trash hauler suspended last month by city authorities for posing an imminent danger to the public, appears not to have had much regard for those safety regulations. New York State Department of Transportation investigators found that on nearly 300 occasions between June and August of this year Sanitation Salvage drivers had been sent back out to work despite having been on duty for 70 or more hours over the prior eight days. In many other instances, the investigators were unable to actually tell what shifts had been worked by drivers because the company had failed to keep the required records — some 640 times, by the count of investigators. In a statement, Sanitation Salvage spokesperson Michael Johnston said, “While this decision fails to fully correct the city’s improper and unprecedented action, which was a misguided response to political pressure, Sanitation Salvage is pleased it affords the company a path to address the BIC’s concerns, resume operations providing safe, efficient waste removal services to its 5,700 small-business customers, and welcome its 87 employees back to work. Sanitation Salvage was represented at the hearing by Randy Mastro, a former deputy mayor under Rudolph W. Giuliani. Mastro served as the first acting chairman of the oversight agency for a brief period in the 1990s. At last week’s hearing, Mastro argued that the suspension was unwarranted and improper. Mastro said the BIC, first known as the Trade Waste Commission, had been meant to root out mob influence in the industry, not to play a role in enforcing safety standards. Mastro declined to respond to specific questions from ProPublica, saying the company’s filings at the hearing reflected its position. “BIC is an agency aimed at maintaining business integrity, not vehicular safety. Its purpose is, and always has been, to eliminate the presence of organized crime in the trade waste industry,” lawyers for the company argued in an Aug. 27 petition. ProPublica has reported on Sanitation Salvage in recent months, including its role in two deaths. 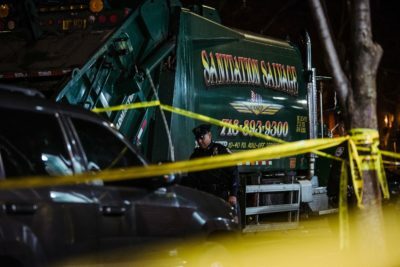 ProPublica and Voice of America revealed that Sanitation Salvage workers lied to the authorities about one of the fatal crashes involving the death of an off-the-books worker for the company in November 2017, telling police that their colleague of over a year — 21-year-old Mouctar Diallo — was an unknown homeless man who jumped aboard the truck. The stories included claims by current and former workers of dangerous job conditions, with drivers and other employees pushed through punishing shifts as long as 18 or even 21 hours. ProPublica and Voice of America reported that more than five years ago labor organizers sent the BIC a 108-page memo about Sanitation Salvage that included sections with headings like “wage theft” and “unsafe operations.” The memo outlined the role of a union at Sanitation Salvage run by a soldier in the Genovese crime family and an alleged Genovese associate. The BIC said it had shared some of the material with prosecutors and other agencies but did not specify who they were or what was turned over, and it does not appear any prosecutions resulted. The BIC said it conducted an audit of the company’s operations from 2013 to 2015, resulting in the agency fining Sanitation Salvage $85,000 for its failure to maintain books and records. The BIC said the role of the Genovese soldier was “thoroughly investigated” and “the evidence did not sufficiently establish that there was an improper relationship” with the company. The agency did not respond to questions about the alleged mob associate. In June, ProPublica revealed that both the Genovese soldier, who later was convicted by federal authorities for an unrelated extortion racket, and the mob associate continue to receive compensation from the union, and current workers identified the Genovese associate as the primary official who negotiated union matters with Sanitation Salvage’s owner. Workers said the union was a sham, installed by Sanitation Salvage’s management over a decade ago and little more than a tool for the owners to exploit employees, thus providing them no recourse to address complaints about hours, unsafe work conditions or pay. Sanitation Salvage has not responded to detailed questions about its relationship to the union. The union that ostensibly represents Sanitation Salvage workers has not responded to requests for comment. In an interview on April 23, days before the second fatal accident involving Sanitation Salvage, the BIC’s commissioner, Daniel Brownell, said the company was the subject of an active investigation by his agency. Court filings submitted by Sanitation Salvage and determinations made by the BIC raise additional questions about how urgently the agency handled its investigation of the company. As previously reported by ProPublica, the BIC said that it learned of the possibility that Diallo, the 21-year-old killed last November, was in fact a company worker from labor advocates in January 2018. 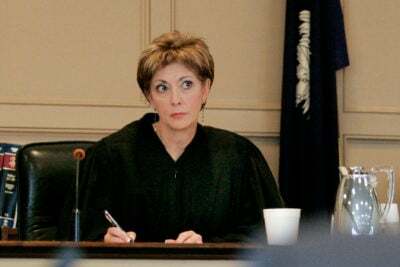 Brownell attended a meeting in February of Sanitation Salvage workers where numerous men said they had worked with Diallo and that company supervisors knew him. The workers also shared complaints about unsafe working conditions and a widespread practice of employees paid off-the-books at a rate of $80 for shifts as long as 21 hours. 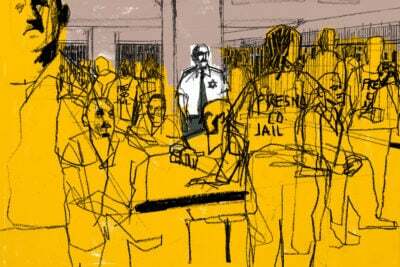 In interviews with the BIC in mid-March, Diallo’s driver recanted his lie and admitted that Diallo had been working at the time of his death in November of 2017. But no immediate action was taken against the company or the driver behind the wheel for Diallo’s death. That driver, Sean Spence, was again behind the wheel in late April when his truck struck and killed an elderly man on a Bronx Street. Only then did the BIC request that Spence be suspended from driving and begin an inquiry into his background, according to the agency’s own records. Now, the BIC’s documents submitted in Manhattan Supreme Court last week by Sanitation Salvage’s attorneys show that the agency’s audit of Sanitation Salvage’s records did not begin until April 30 — days after the second death and a week after Brownell told ProPublica his investigators were hard at work. The BIC did not respond to a request for comment about the timing of the audit. Over the last three years, Sanitation Salvage vehicles have been involved in 58 collisions. On May 7, 2018, a Sanitation Salvage truck struck a motorcycle at a Bronx intersection. The driver of the truck had been involved in two other collisions in the prior 12 months. On Aug. 9, investigators found that a Sanitation Salvage driver crashed at the Hunts Point Produce Market in the Bronx and fled the scene, having caused $25,000 in damage. For years, Sanitation Salvage also had failed to properly disclose all of its employees to the agency within 10 business days of their hiring as required by law; as such, “Sanitation Salvage has likely provided the commission with false or fraudulent information in license applications,” the BIC found. On the night before last week’s hearing, Sanitation Salvage handed over to the BIC a new list of 25 previously undisclosed employees — some of whom had been working for the company since at least 2015, according to the determination. What’s more, the list omitted required information like driver’s license numbers for seven of the drivers, and date of hire was missing for numerous employees, according to the BIC. On Aug. 23, a BIC investigator caught two different Sanitation Salvage trucks with unreported employees and unlicensed drivers. First, on Park Avenue in the Bronx, a helper was at the wheel of a truck that was reversing the wrong way down a one-way street. The helper said he had worked for the company for 16 years, and yet the company had failed to ever report him as an employee as required. Later that night on Fordham Road in the Bronx, the BIC investigator questioned the driver and helper on yet another company truck. The company had never registered the driver with the BIC. The investigators witnessed the helper get behind the wheel of the truck. Not only was he not authorized to drive the commercial vehicle, the investigator found, his personal driver’s license had been suspended as well. ProPublica asked the BIC whether a settlement with Sanitation Salvage that included the installation of a monitor would bring its investigation of the company to a close. A spokesperson did not immediately respond.